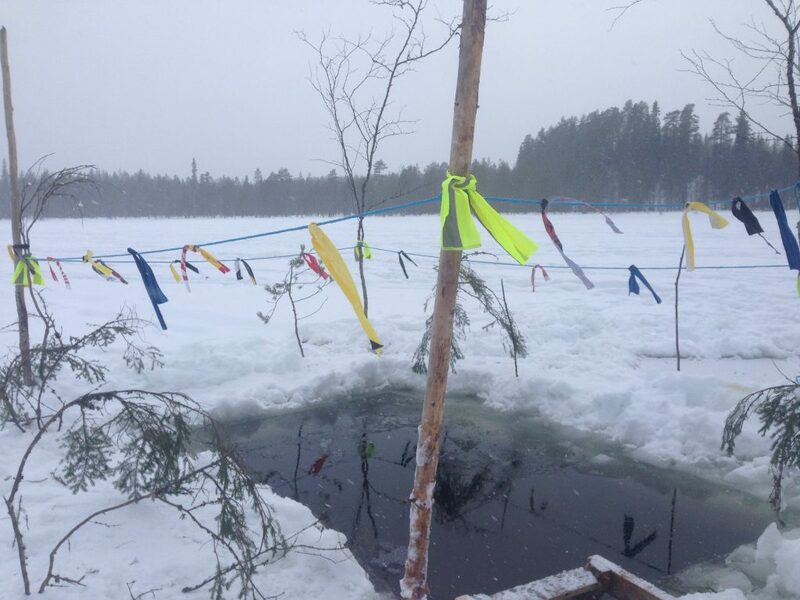 It’s been a while…so this is looking back to last February and March, which I spent in Kainuu area. I was volunteering in an international artist residence called Mustarinda. The location is the second snowiest place in Finland, and I surely did some hard-core snow shovelling on the roofs and in the yard…but I really loved it! Recent winters in southern Finland have been with so little of snow, so it was great to experience loads of it. 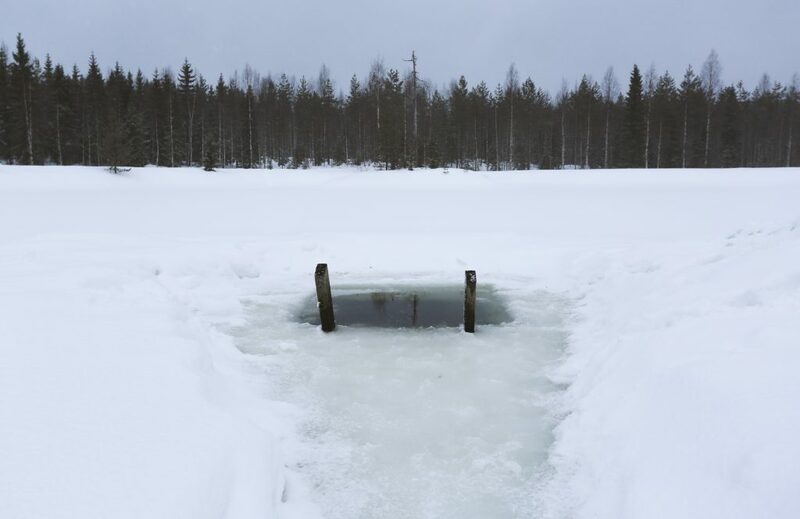 It was like in my childhood in Central Finland. 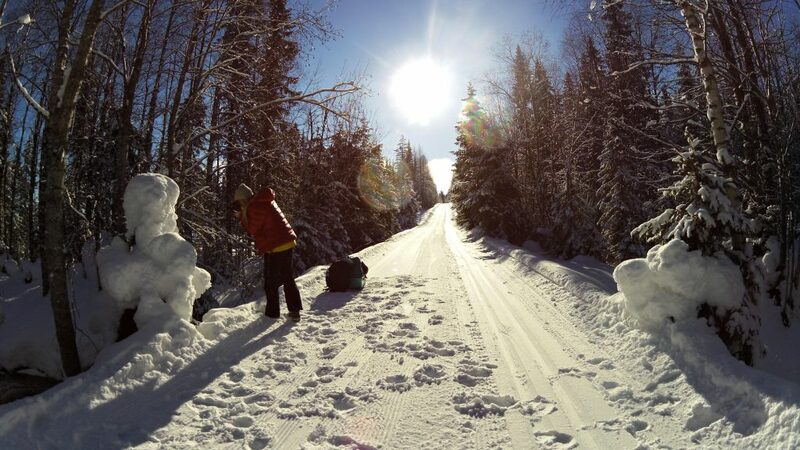 I skied and walked with snowshoes in old spruce forests. It was magical, Northern lights up above. 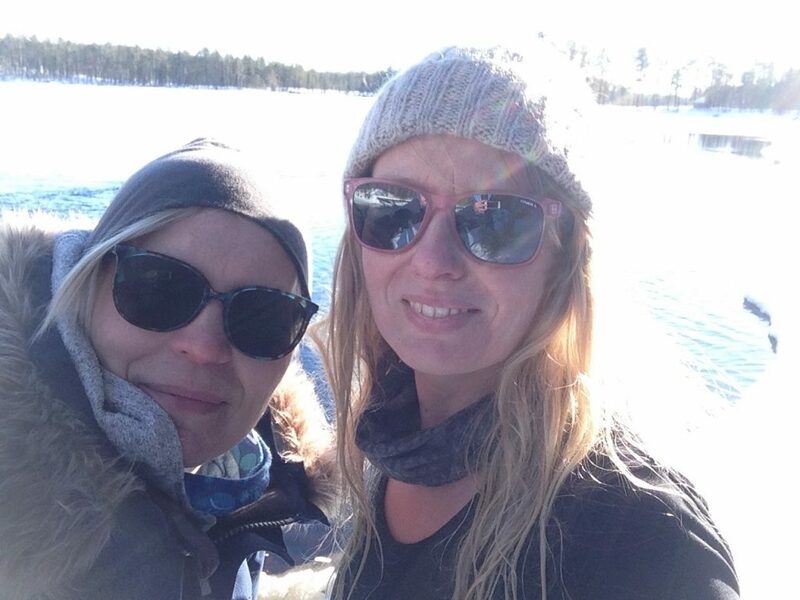 When my dear friend Vivienne arrived to the residency for a month, it didn’t take long before we were looking for water and an icy swimming adventure. 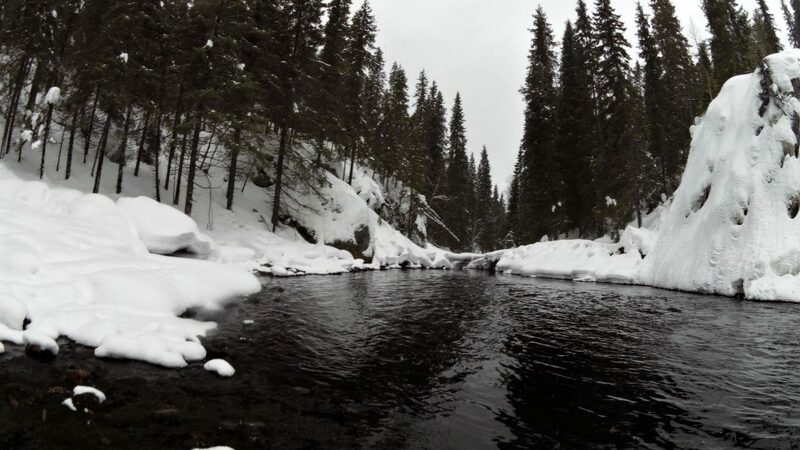 I found a melt brook near a ski track. 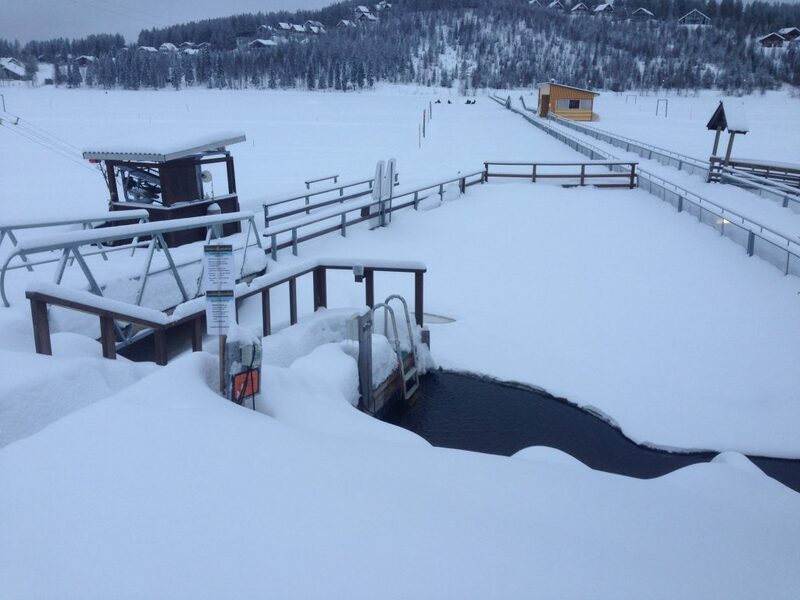 There was one-meter snow around it, so no easy access for swimmers. But we were desperately for a dip. 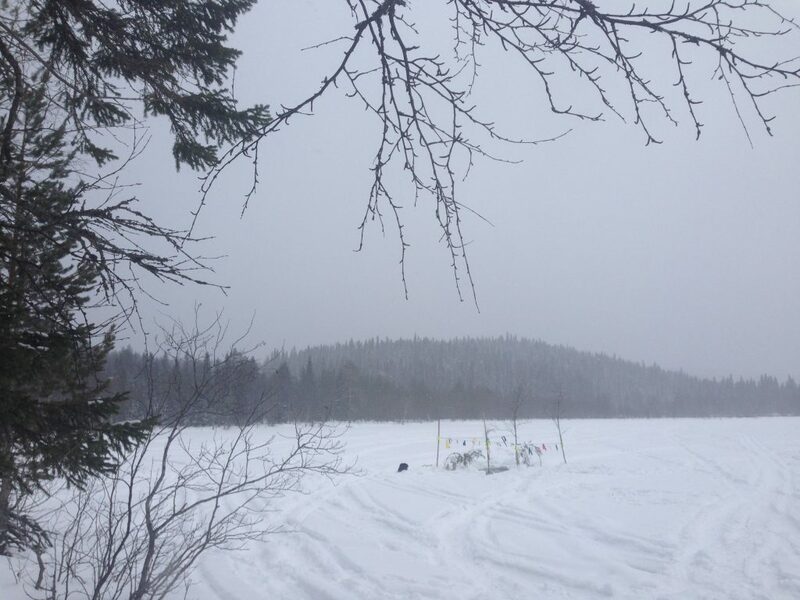 So I shovelled our way to the water. 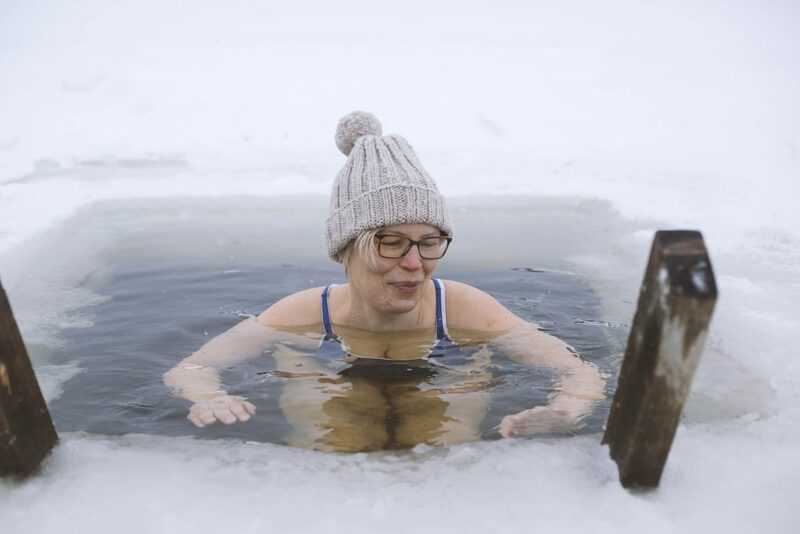 Well, that dip wasn’t enough for us obsessed winter swimmers. We started to dream bigger. 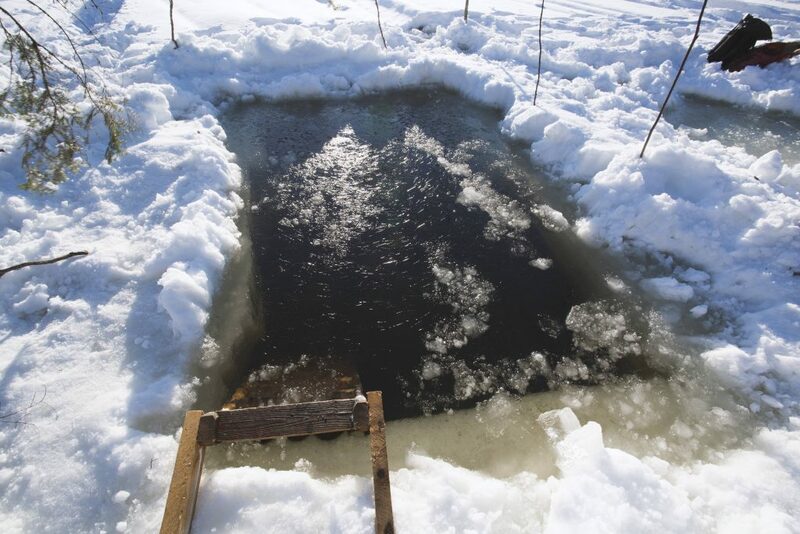 Gladly other folks at Mustarinda also got interested in ice swimming…well, at least they got interested in ice pool making. One day we all went together to the near-by small lake (nearby means 2 km straight down the Paljakanvaara Hill). It was supposed to be easy ice breaking with Markku’s (the caretaker of the Mustarinda house) chain saw. But the thick ice was too much for the machine…so we ended up sawing ice with a hand ice saw. It was a sweaty business, but no need of warming up otherwise before swimming. 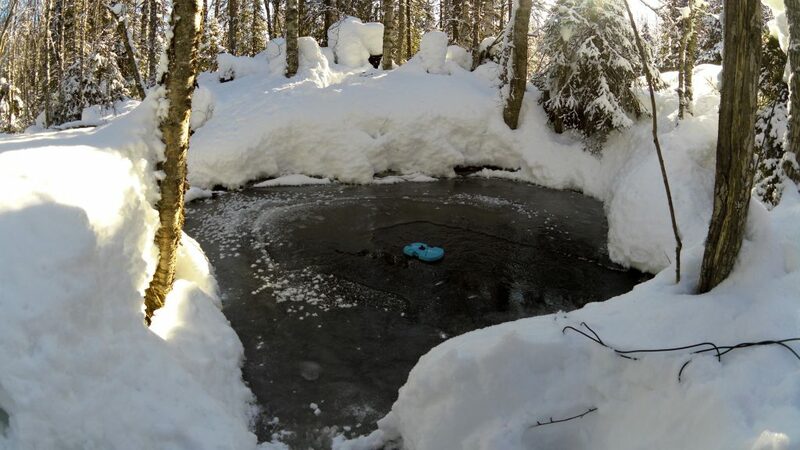 When big ice cubes were sawed off, we pushed them under the ice with sticks, shovels etc. 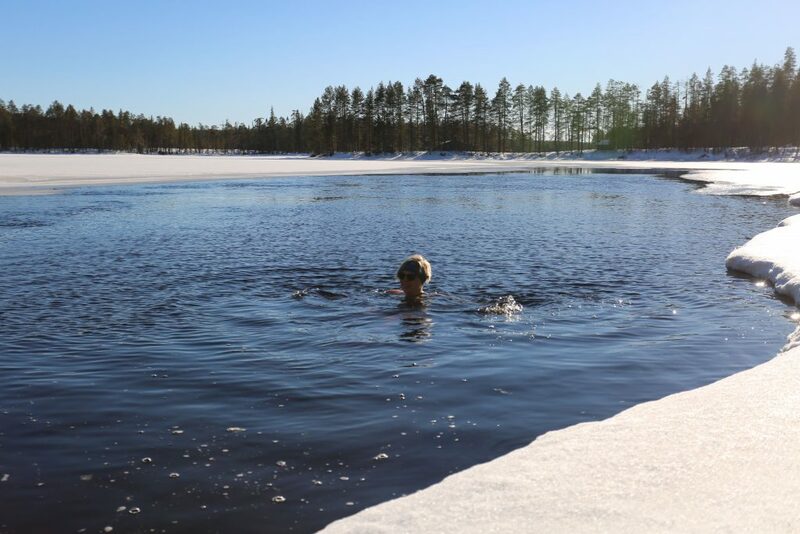 It was a big pool, 2 m x 3 m. Read how Vivienne describes our adventures on her own blog and on Outdoor Swimming Society website. She writes so nicely about avanto ( = ice hole in Finnish). Photo 1.-5. credits to Vivienne. 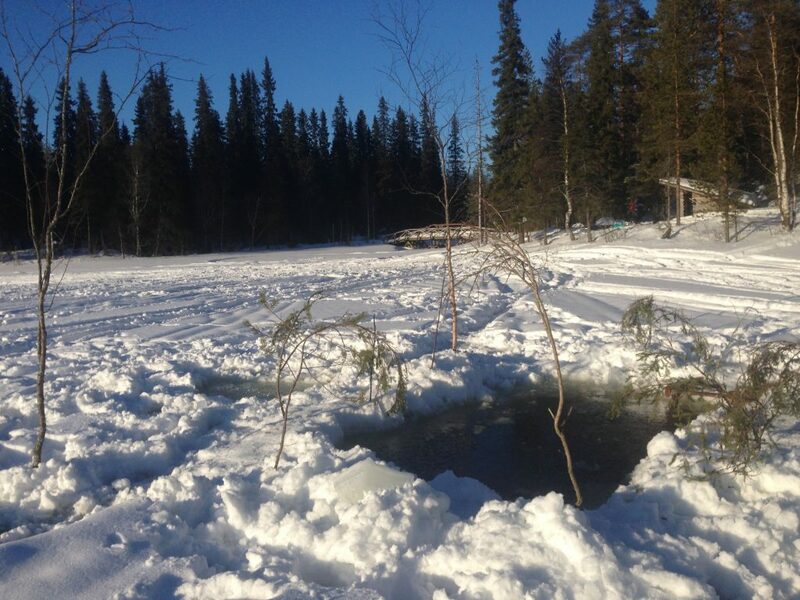 We found two ready-made ice holes in the area. 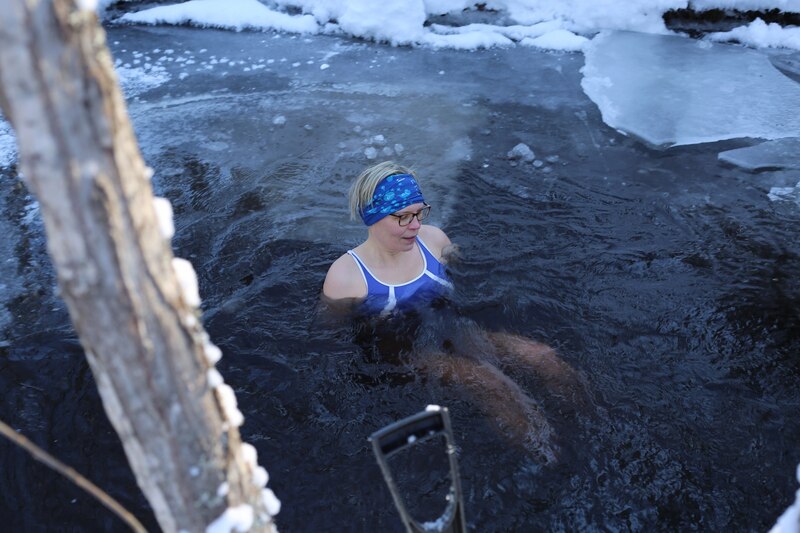 One was by a small sauna at Paljakka village, and the other one at skiing centre Ukko-Halla. We swam everywhere without sauna, nor did we have any (warm) dressing rooms. When the temperature changes are not that radical, it’s easier to dip yourself into cold water. After a while of cold exposure, you’ll start to feel warm. And this euphoric feeling stays quite long in your body and mind. You’ll feel fresh, energised and happy. So did we! Photo credits 1.-3. and 5. to Vivienne. We also visited the new Hossa National Park. Hossa “is a meeting point for three waterways, and, therefore, there are a large number of flowing waters in the area. 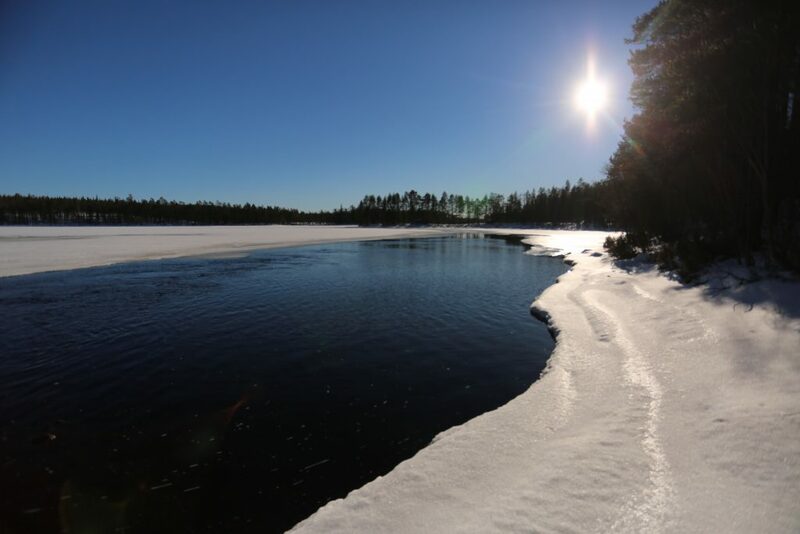 The number of lakes and ponds is more than one hundred.” (nationalparks.fi). We walked on ice of the canyon lake Julma-Ölkky. This is lake is now on my bucket-list: I want to swim the lake from one end to the other end next summer. There are rock paintings, high grey walls and wild forests along the 3 km long lake. On the way home, we found a melt by a bridge. 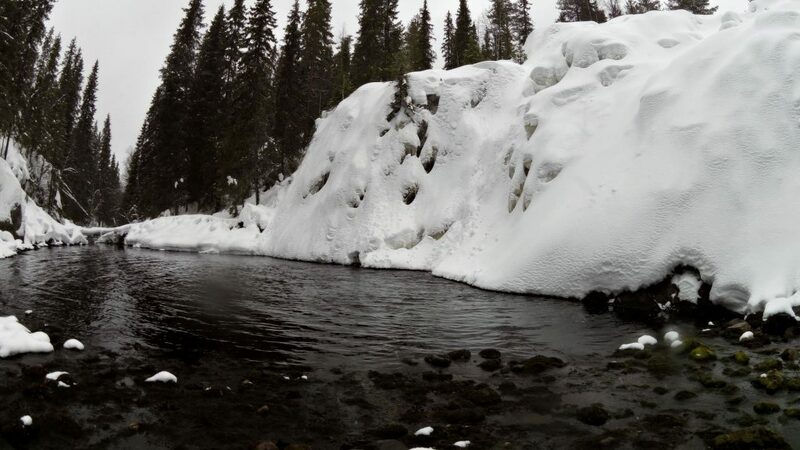 It was a joy to dip yourself in refreshing cold water after heavy walking on ice, snow and slush. 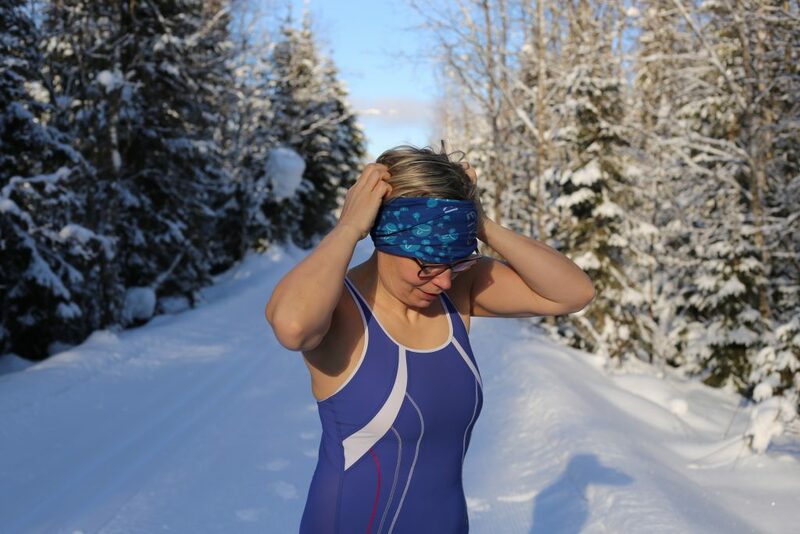 Kainuu is a great area for a winter swimming adventure holiday!